And now Bongbong Marcos wants to rewrite history. How dare him! Whitewashing, glossing over the martial law years. Even revising history by saying that Marcos did the country great by declaring martial law – peace and order, discipline, econominc growth, strong leadership – all lies! Lies being perpetuated by the Marcos family and their mercenaries. Let us make sure that we do not celebrate Ferdinand Marcos. Let’s celebrate Edjop, Ditto, and Jun. Let us be vigilant that history is written as it was and the truth is that martial law was a dark chapter in our history. 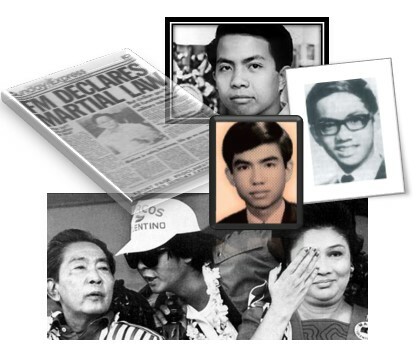 Let us remember those who died during martial law. Let us declare Sep 21 as Araw ng Kagitingan to honor those who suffered and died under martial law. And let us not elect Bongbong Marcos as vice-president. Vote Mar Roxas for president and Leni Robredo for vice-president.